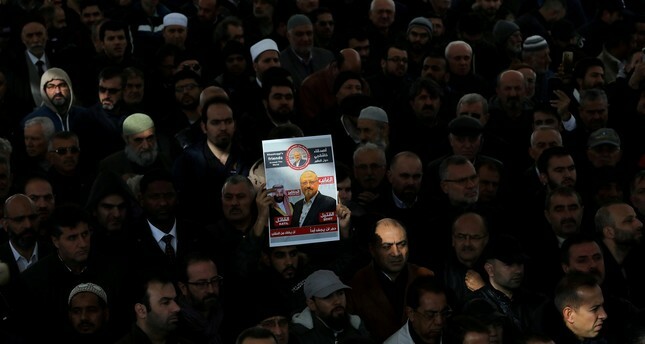 People attend a symbolic funeral prayer for slain Saudi journalist Jamal Khashoggi at the courtyard of Fatih Mosque, Istanbul, Nov. 16, 2018. Four months have passed since Jamal Khashoggi, a columnist for The Washington Post, was brutally murdered and dismembered inside Saudi Arabia's Consulate in Istanbul. Although Riyadh was shamed into an admission of guilt after repeated denials, it kept looking for ways to make the world forget about what happened. The Saudi "investigation" into the Khashoggi murder stopped short of holding accountable the most senior official who ordered the hit on the Saudi journalist. Instead, the country's attorney general limited his inquiry to the foot soldiers that carried out Riyadh's orders. Due to a total lack of transparency, we have no way of knowing whether Saudi Arabia actually charged the murderers or carried out their sentences. Step by step, Riyadh managed to cover up the Khashoggi murder. Even an official report, which purports to link the journalist's death to Saudi Crown Prince Mohammed bin Salman (MBS), has been kept from the people. The reason behind that decision isn't exactly a secret. As early as November, U.S. President Donald Trump had made it clear where he stood on the issue: "We're not going to give up hundreds of billions of dollars. If we broke with [Saudi Arabia], oil prices would go through the roof." Other governments followed suit. Unfortunately, Turkey's push to hold all criminals accountable lacked the necessary support. Still, the investigation into Khashoggi's death is too significant to be left to the Saudi court system. Going forward, international organizations and the international community will be obliged to take action. First, the United Nations must take the necessary steps to serve the cause of justice. Agnes Callamard, the special rapporteur on extrajudicial, summary or arbitrary executions at the Office of the U.N. High Commissioner for Human Rights, visited Turkey last week as part of her inquiry into the murder. In addition to meeting officials and journalists familiar with the evidence, she allegedly heard the notorious audio recording of the columnist's final moments. According to sources, the U.N. delegation was convinced that MBS was behind the journalist's death. The international community, too, must speak up. Provided that even U.N. investigators privately hold the kingdom's de facto ruler responsible for the murder, public figures, including artists, business leaders and scientists, must refrain from legitimizing the Saudi crown prince's rule. Hence the backlash against Mariah Carey's decision to perform in Saudi Arabia. Last week, the R&B singer defied human rights advocates and activists to perform in King Abdullah Economic City. Carey may have been more than fairly compensated for her appearance, but she hurt her personal brand – which had been associated with her music rather than murder until now. Had she mentioned the Khashoggi murder during her performance, she may have made up for her irresponsible decision. Even though Saudi Arabia throws a lot of money at its Khashoggi problem to make it go away, the world will keep demanding justice for the slain journalist. The victim's friends and colleagues continue to raise awareness about what happened. On Sunday, The Washington Post debuted its first Super Bowl commercial, narrated by actor Tom Hanks, to highlight the importance of newsgathering and the dangers journalists can face. At the same time, Turks are preparing to take the Khashoggi investigation to the international level soon – even if they have to go at it alone. If Turkey pulls the trigger on an international investigation, the world will certainly remember the murder that the Saudis want to cover up and the man they want the world to forget.